How to upgrade the firmware of HDML-Cloner Box Pro? Q: How to upgrade the firmware of HDML-Cloner Box Pro? If your S/N of HDML-Cloner Box Pro begins with DP, like DPXXXXXX, the latest firmware file name ends with V 1.39 or above. The decompressed files are named as “jedi2.img” or “MERGE2.bin”. If your S/N of HDML-Cloner Box Pro is in the format of CPXXXXXX or 596998****************, the firmware file name ends with V 1.35 or earlier. The decompressed files are named as “jedi.img”, “MERGE.bin” and “readme.txt”. 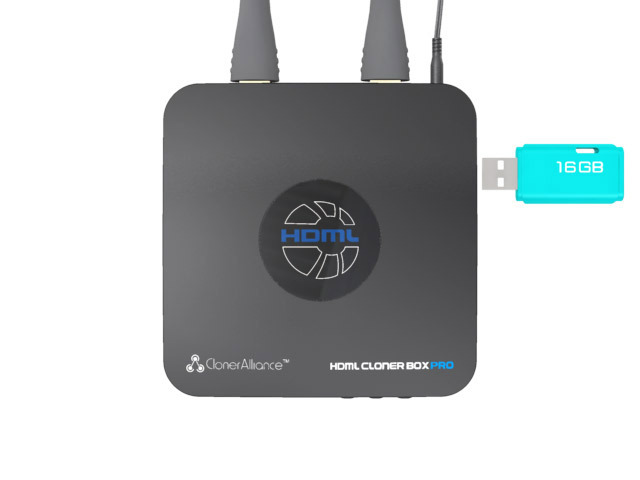 Download the firmware of HDML-Cloner Box Pro from https://www.cloner-alliance.com/download.html. Unzip the firmware package and you will get two files "jedi2.img" and "MERGE2.bin". Copy the files "jedi2.img" and "MERGE2.bin" to the USB flash drive by plugging it into the computer. Please ensure that you have put the two files in the root directory of the USB flash drive. Changed in version V1.40: Since there is only one file “MERGE2.bin” in V1.40 version firmware, just simply copy the “MERGE2.bin” to your USB flash drive and jump to Step 6. 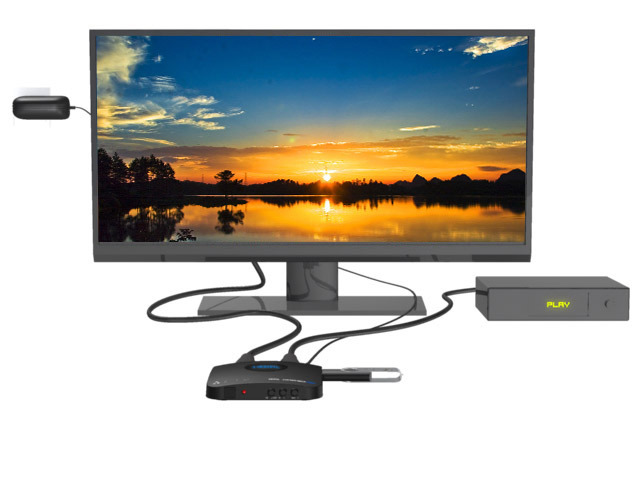 Connect the power adapter to HDML-Cloner Box Pro and plug the USB flash drive into the "Storage" port of HDML-Cloner Box Pro. If you can find "ON/OFF" button on the device, you need to press and hold the "ON/OFF" button for about 5 seconds to turn on the power. Note: If your S/N of HDML-Cloner Box Pro begins with DP, like DPXXXXXX, please just skip the step directly. The LED light will blink quickly between green and blue alternately. The upgrade process will last about 30 seconds. After 30 seconds, please press and hold the "ON/OFF" button for about 5 seconds to turn off the power. 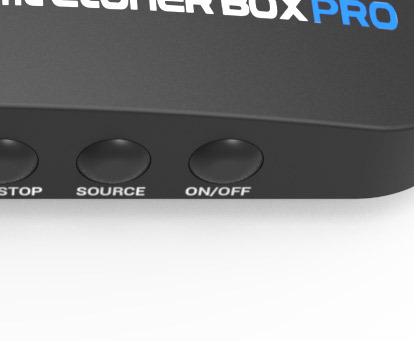 Note: If your S/N of HDML-Cloner Box Pro begins with DP, like DPXXXXXX, you don't need to press the button for there is no "ON/OFF" button on your device. After the upgrade is completed, the firmware file "jedi2.img" will be deleted automatically. Please plug the USB flash drive to your computer to check. If "jedi2.img" is still in the flash drive, please try the process above again. Now plug the USB flash drive into HDML-Cloner Box Pro again. Please confirm that you can see pictures on your family-video first. 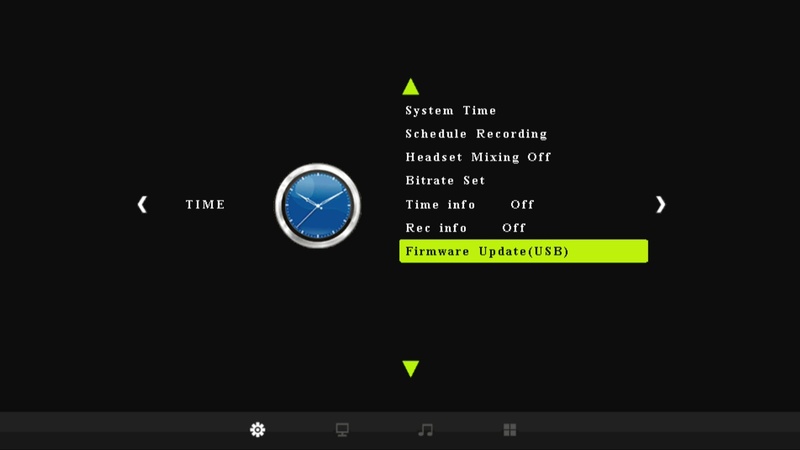 Please press the MENU button on the remote control, select "TIME" - "Firmware Update (USB)" - "YES" on the pop-up window and then it is in the process of upgrading automatically. When the process goes to 100%, HDML-Cloner Box Pro will reboot and then the upgrade is completed successfully. After the upgrade, press the MENU button on the remote control, select "Restore Factory Default" - "YES" on the pop-up window and then it is in the process of resetting automatically. After the reboot, you can enjoy the new firmware and check the version number. Note: In the process of upgrading, please don't turn off the power. If HDML-Cloner Box Pro fails to work due to unexpected power outage, please return it to us for repair.